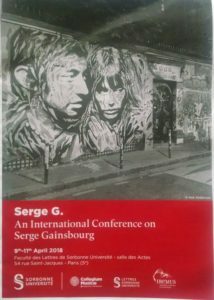 Professor of French Studies Kirk Anderson recently returned from the first international colloquium on Serge Gainsbourg at the Sorbonne. The conference featured three full days of talks devoted to the notorious songwriter, singer, film-maker, and provocateur. Professor Anderson’s presentation, entitled “Extrêmement pop: Serge Gainsbourg et le ‘Swinging London,'” dealt with the artist’s assimilation of “British Invasion” sounds into a French tradition of chanson.